DHL has distanced itself from a pilot protest at its US headquarters yesterday. 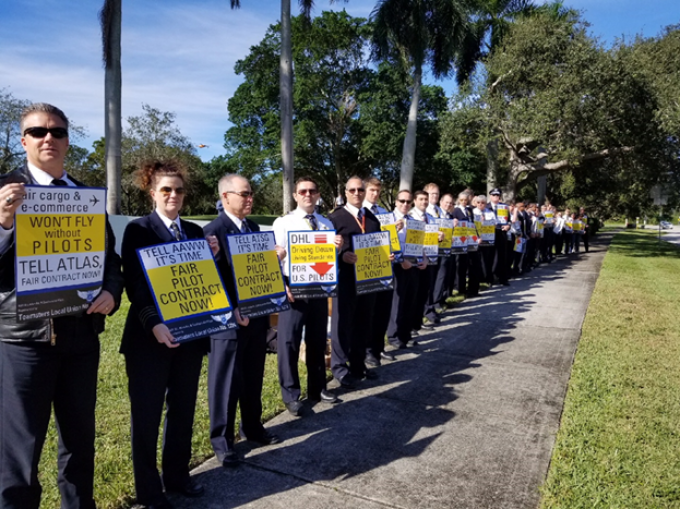 Pilots who fly for Atlas Air and ABX Air on behalf of DHL protested in an effort to ramp up pressure on the airlines to improve working conditions. Germany’s Deutsche Post-DHL is one of Atlas’s largest customers and is Atlas-owned Southern Air’s only customer. But despite the pilots’ attempts to lobby DHL to put pressure on the US airlines, the customer was careful to steer clear. In a statement to The Loadstar, a DHL spokesperson said: “The pilots who are raising these issues work for our airline partners. DHL is not a party to the negotiations between our independent suppliers and partners and their employees. As a non-US company, DHL is not allowed to majority-own, or be seen to exert a level of influence comparable to a majority owner of, a US airline. However, it is close to the limits: it owns 49% of Polar Air Cargo and is a significant customer of the Atlas group and ABX Air. The Airline Professionals Association Teamsters union said: “For years, management at all three carriers [Atlas, ABX, and Southern] have been stalling negotiations to improve their outdated contracts. “They argue they can maintain and attract a sufficient number of pilots to work for them at current wages, terms and benefits that are below industry norms. The protests followed the release of the results of a survey of Atlas and ABX pilots, which found 75% believe customers, including DHL, are being misled over the problems facing both carriers. Furthermore, some 60% of those polled said they would be leaving their jobs at the carriers to work for DHL competitors, including FedEx and UPS.